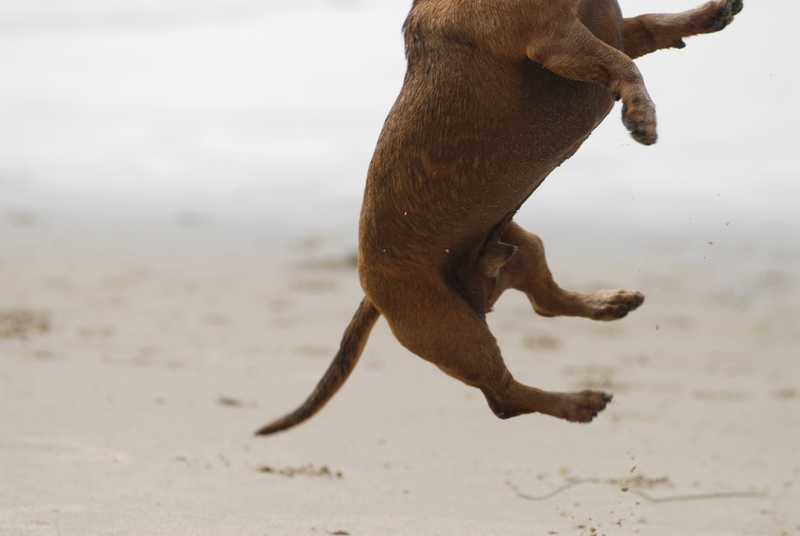 If I define exuberance in its purest form, it is my dachshund, Lincoln. Particularly on the beach, and exacerbated by the “chuck-it” and tennis ball. In fact, he is so crazy when it comes to tennis balls, they have been known to cause him temporary insanity. I recall a particular day in the sleepy town of Solvang, strolling at a snail’s pace down one of the streets named with first a suffix, and then a “dag,”dotted with picture windows overrun with Danish tchotchkes and bedazzled wine country paraphernalia. Along came an elderly gentleman, likely in the twilight of his 90s, walker adorned with chartreuse tennis balls on its stoppers that shuffle-dragged in time with the man’s slippered feet. Suddenly Lincoln lunged at the walker, seizing a tennis ball with his vice grip, and tugging feverishly at the enthralling green fuzz. The man, with sense of security compromised, began to panic, shouting in fear, yet fighting the smile on his deeply-creased face. After all, who doesn’t laugh at a crazy clown of a dachshund?